In the event that Varoufakis instigates a Grexit (a Greek exit from the Euro and possibly the EU) it would involve a default on their sovereign debts of 320 billion Euros, which would entail enormous financial derivative fallout resulting in a bank crisis that would far exceed that of 2008. There is an estimated USD$ 26 Trillion of derivatives attached to the Greek debt. Imagine what would happen to the financial system if USD$ 26trillion was wiped out. Under such circumstances there would be a very substantial shift in investor sentiment, and the priority the return of capital, rather than the return on capital and the emphasis would be to identify suitable safe financial havens, which would include gold and silver, particularly in view of the fact that the precious metal prices have been beaten down to unrealistically low levels since their highs of 2011. The strong stance adopted with the EU by Syriza, the new ruling party in Greece, has been supported by approx 80% of the Greeks. It appears that Tsipras, the Greek Prime Minister and Varoufakis, the Greek Minister of Finance have severely rattled the Troika. Indeed Tsipras and Varoufakis refuse to recognise, or to negotiate with the Troika per se. The EU are faced with a quandary, in that the Greek request for a substantial write down of their sovereign debt is understandable, insofar as the current debt load is clearly beyond the country's ability to service. However, if Brussels agreed to an appreciable write down of the Greek debt, they would undoubtedly receive applications from other Eurozone countries for similar treatment i.e. Spain, Portugal, Ireland and Italy, which would be financially, as well as politically, insupportable. Therefore, it appears to have been decided in Brussels (and Berlin) that the best result for the EU would to maintain the current austerity driven status quo. The strategy that seems to have been adopted is that of unyielding inflexibility, in the hope that it would cause Tsipras and the Greek Minister of Finance to buckle under the pressure. In that regard it should be borne in mind that Greek banks are experiencing heavy withdrawals of funds by customers, which has required the Greek Central Bank to seek emergency liquidity assistance (ELA) from the ECB. In addition the Greek Govt has a cash flow squeeze which will prevent it from meeting its scheduled sovereign loan repayments to the Troika. The funds are estimated to run out in very early March. It is now clear to Syriza that the EU is not prepared to make any meaningful concessions to the Greeks. So what are Tsipras and Varoufakis to do ? The press reports after Friday 20th Feb Eurogroup negotiations indicated that the Greeks will have to accept the current status quo, with a few semantic amendments; plus they had to submit, by close of business on Monday 23rd Feb, a list of reforms that Syriza is prepared to introduce to ensure that Greece will continue to meet its financial commitments to the Troika (now to be referred to as 'the institutions'). There was a slight delay, in that the list of proposals was submitted to the Eurogroup on the morning of Tuesday 24th Feb. Very shortly thereafter, some press reports emerged that the list of reforms and the accompanying letter, signed by Varoufakis had signed, had been prepared by an economist in the European Commission, and not Varoufakis !! 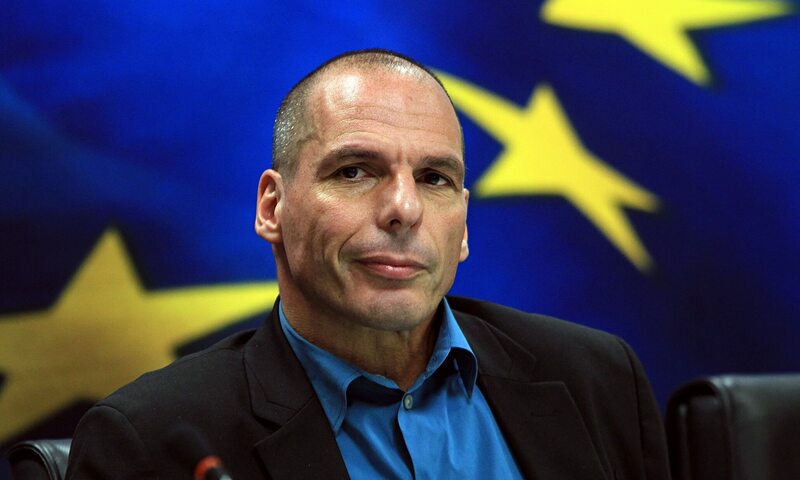 Had Tsipras and Varoufakis done a complete volte face in their stance ? Are Greece still committed to implementing Syriza's election promises? If so, are they seriously prepared to make a Grexit? If the answers are yes, then buying 4 months time to make suitable preparations for an orderly Grexit would obviously be preferable. However, how are Tsipras and Varoufakis going to be able to sell the concessions needed to secure the 4 month debt extension to the Syriza cabinet, and to the general Greek population, without losing their confidence, especially when it goes against the election promises that got them into power in the first place? In addition, how are Tsipras and Varoufakis going to ensure that the EU and Germany do not turn off the financial taps during this 4 month debt extension ? As detailed above, the EU/Germany have adopted an inflexible stance towards Syriza's efforts to negotiate a sensible restructuring of the Greek sovereign debt. This strategy reminds me of the manner in which the Troika sandbagged the new Cypriot leader in 2013, which led to the Cypriot bank bail-in. I therefore suspect that the EU/German game plan has been to gradually lure Tsipras and Varoufakis into a corner, and will probably only drip feed additional funds necessary to avoid a Greek default, provided that the Greeks shoe evidence of complying with the Troika’s (sorry, 'the Institutions') conditions. Go for an early, and very disorderly Grexit, and hope that Russia and China will provide the necessary support, which from a geopolitical point of view might be prove very attractive to both Putin and Xi. 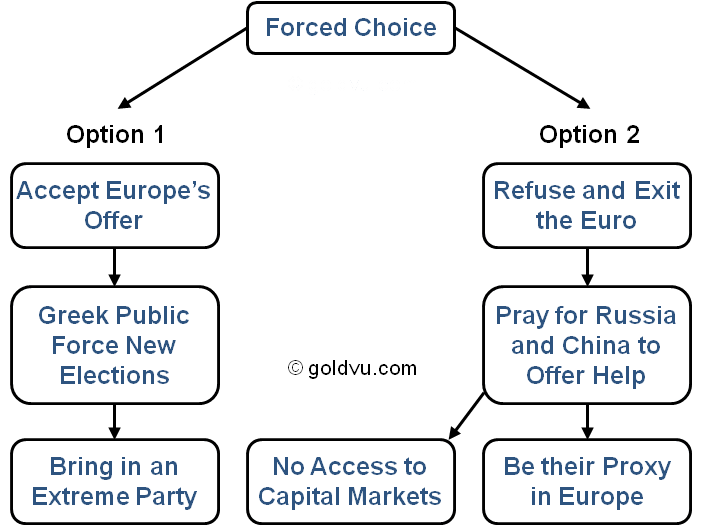 If the first option is selected then the chances are, that a popular backlash may force a vote of no confidence in Parliament and possibly result in another election, and that will be the end of Tsipras and Varoufakis, and that will ensure the continuation of the current austerity driven status quo, which would no doubt greatly please the Troika, and Germany in particular. However, such an election may see an even more extreme party elected, which would raise the risk of a Grexit to entirely new levels. If the second option is selected, it will involve Greece defaulting on its international debts, and being frozen out of the international capital markets. If Greece reneged on its entire sovereign debt such an event would trigger the USD$ 26 Trillion in financial derivatives. This second option would undoubtedly involve many hardships for Greece, as life would get materially worse before it had any chance of improving. The severity of difficulties would be dependent on whether or not Russia and China provided suitable support. Any decent chance of success in the medium/long term would require financial support and commercial assistance from Russia and/or China, as well as quality Greek leadership, vision, a great deal of determination, innovation and discipline (Greece has not displayed of these attributes in recent decades), but as the saying goes “necessity is the mother of invention”. However, the Greeks would at least be masters of their own destiny. Obviously the Troika (Institiutions), and Germany in particular, are counting on Tsipras and Varoufakis to buckle under pressure and accept the status quo. However, if the EU/Germans have miscalculated, and Syriza opt for a Grexit (disorderly or orderly) it would IMO, lead to the end of the Eurozone and the Euro, as we know it, sooner rather than later. The resulting financial derivative fallout would probably create a financial/bank crisis that would far exceed that of 2008 and the EU/Germany may come to bitterly regret the manner in which they handled the Greek situation. The stakes are immense, and only time will tell the outcome. Please note that none of the content within any articles on the GoldVu website are offered as investment advice and should not be construed as such.